I have heard people say “I won’t need to do this once they start walking”, or “it’s only for while they are so little”. Every parent decides for themselves what suits them and their child best. However, I suspect that there are advantages to extended babywearing that not everyone has considered. 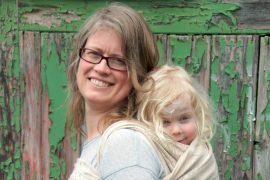 Say the word “babywearing” and people think immediately of bubbas cocooned in stretchy wraps or carried in front packs. 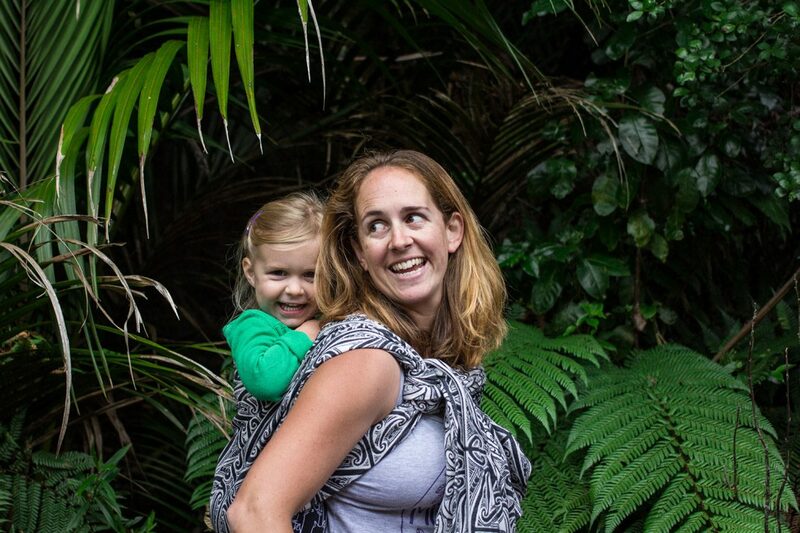 But when does babywearing have to stop? Safety: Ever felt anxious getting your walking/running child out of the car in a carpark, or beside a busy road? Ever worried about losing them in a crowd? 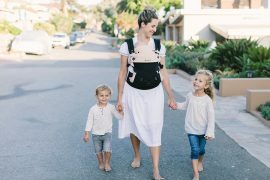 Popping them from the car straight into your favourite quick option, like a ring sling, meh dai or buckle carrier, lets you get them safely to the next thing, all while having hands free to carry a bag or hold hands with an older child. Security: Now this one is theirs more than yours. The world can be a strange and intimidating place. We forget that what is no big deal to us, can often be an array of one new and overwhelming situation after another for our child. 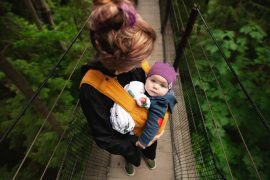 It is so much easier to be in a new or a busy environment and adjust into it, or get a handle on it from the safety of your parent’s back (or hip, or front!). They may not need very long before they are ready to get down and get into it, but having this safe high place to start from can make a world of different as children learn about the world – even places or situations that they go to regularly. Communication: I was recently at an animal photo exhibition with my daughter. I popped her on my back in a carrier, and not only did she get a far better view of the photos from my back, she and I had a really great conversation about each one because she was right there, over my shoulder. Thinking back, I doubt we would have talked anywhere near as much about those animals if she had been standing beside me on the floor. 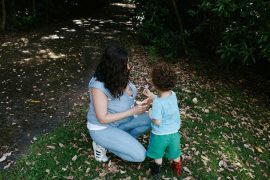 Research has shown that language development is helped best by engaged conversation with a child, not just being exposed to and hearing words around them. 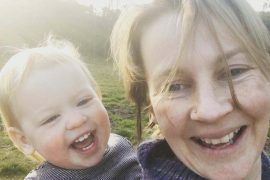 It’s much harder to have an engaged conversation with your child when they are behind you in their car seat, or out of sight in front of you in the pram. You need to make more effort to do that. The bonus for when they are right there on your back, is that it is much more natural and far easier to talk together, as you go. Convenience: It’s a darn sight easier to piggy-back a child in a carrier, than trying to hold them up there freestyle! How many times have you gone somewhere only to have a tired, emotional or slightly injured child need carrying on the long walk back to the car? How many times have you piggybacked unexpectedly, and it has ended up happening for much longer than was comfortable? 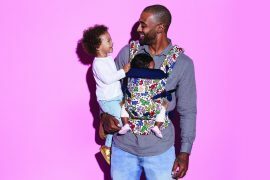 Or have you tried holding both the child and the bags, and it was a nightmare? A secure, comfortable carrier gives you both hands free and is far easier while you walk. Have you tried popping a preschooler up on your hip lately? I don’t know about you, but I can manage about 5 minutes max these days, before my arm’s exhausted; but give me a ring sling and I can do 15mins plus…and she usually only needs about 10 minutes before she’s settled and ready to go off again. It’s much harder to have an engaged conversation with your child when they are behind you in their car seat, or out of sight in front of you in the pram. Plus nothing stops an argument about it being time to leave the Zoo or the playground like strapping them to your back in a carrier and then just walking off to the carpark! Trumps, I win!